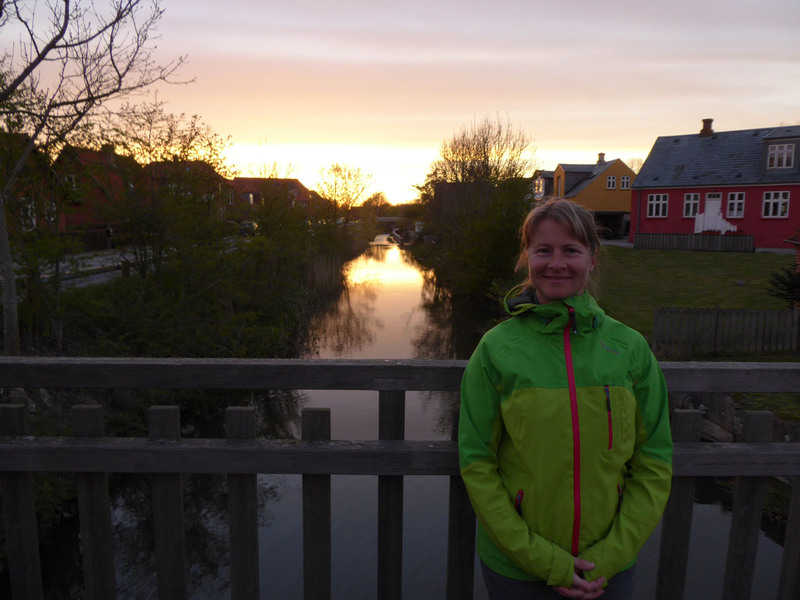 After undertaking several large shopping trips, we crossed from northern Germany into Denmark in a heavily laden and well-stocked Benny. 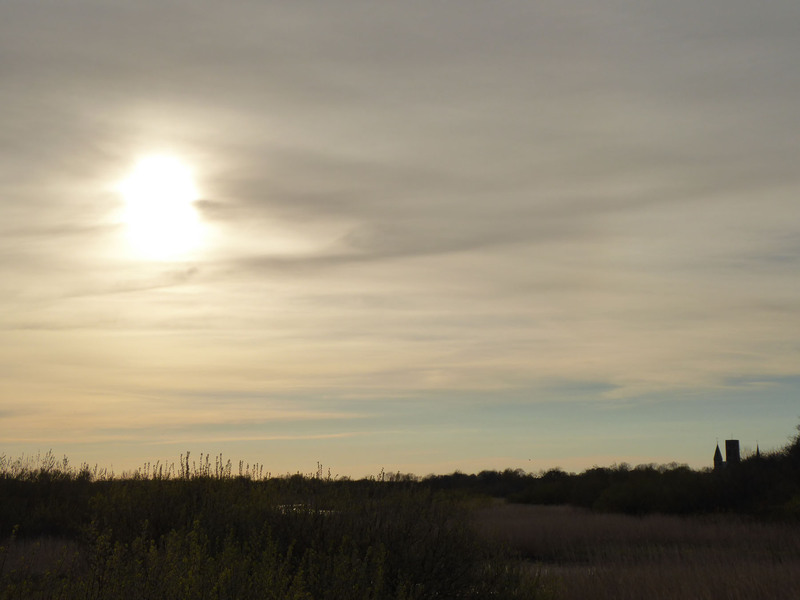 We drove through an unchanging landscape of flat, grey fields lined with low hedges. 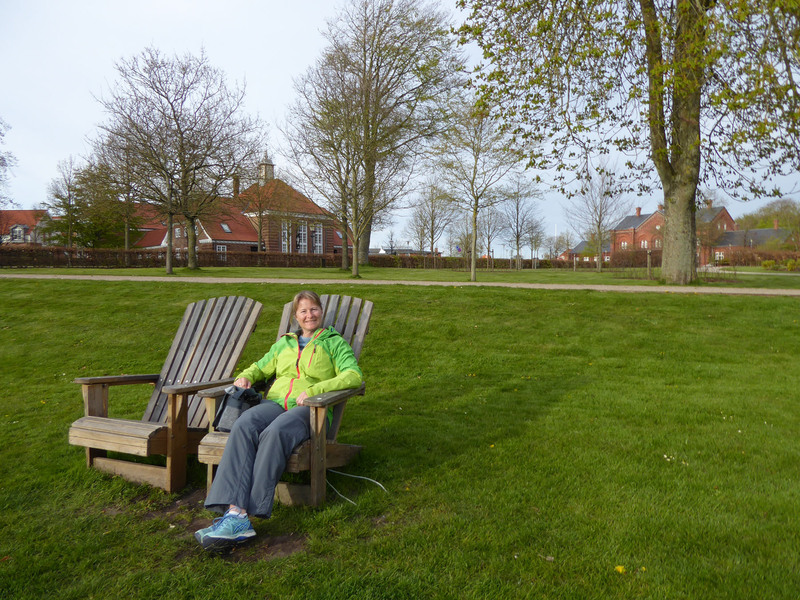 No one could match the Dutch for showing off their clean, immaculate countryside, but the Danes certainly push them close with a simple and well-ordered approach. 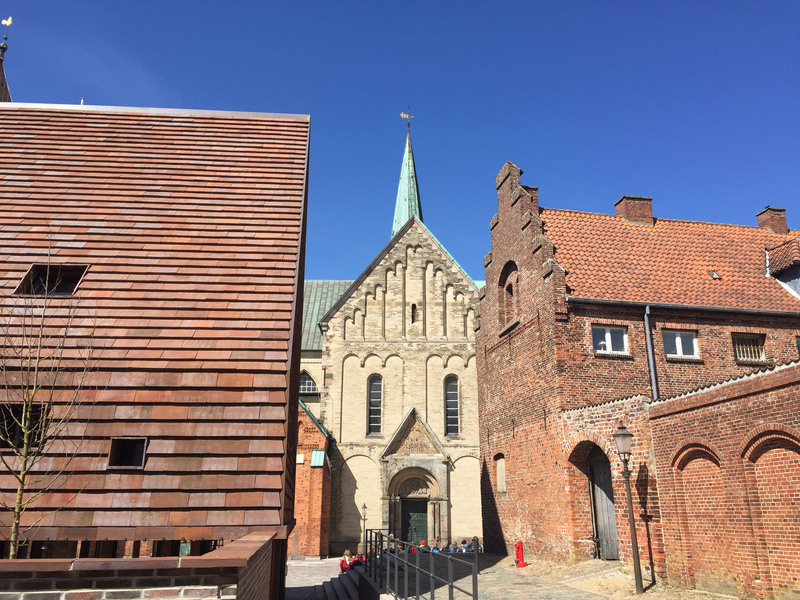 With little effort and very little traffic, we soon arrived in the town of Ribe, the oldest in Denmark, where we parked in a free aire just a few hundred metres from the historic centre. We sneaked a spot adjacent to a grassy area and with a personal picnic table, then walked the short route into town. 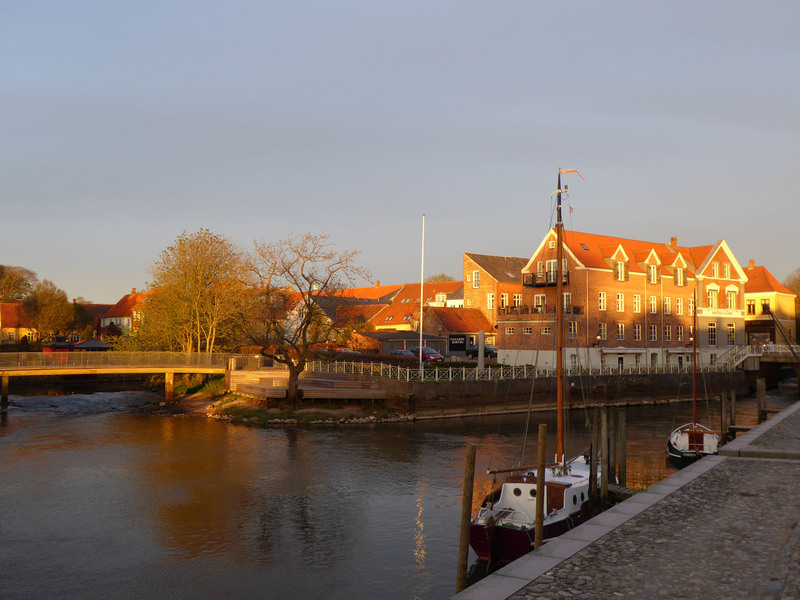 Ribe, established early in the 8th century, celebrated its 1300th anniversary in 2010. We were immediately impressed with the tailored beauty and aesthetic quality of the remaining timber frame buildings. They looked all the more impressive for being framed by a wonderfully bright blue sky and warm, glowing sun above. The huge oak frames, painted black, had weathered and twisted over the centuries, leaving some doorways having lintels sitting 30 degrees off horizontal. The infill panels between the oak frames were neatly painted in varied, subtle colours. We passed a modern building that we thought was wrapped in weathered copper from a distance, but up close we found it was constructed from thick, kiln-fired overlapping ceramic tiles, set on a steeply pitched roof and down the vertical face. It had a wonderfully solid appearance and sat beautifully into the ancient cityscape adjacent to it. 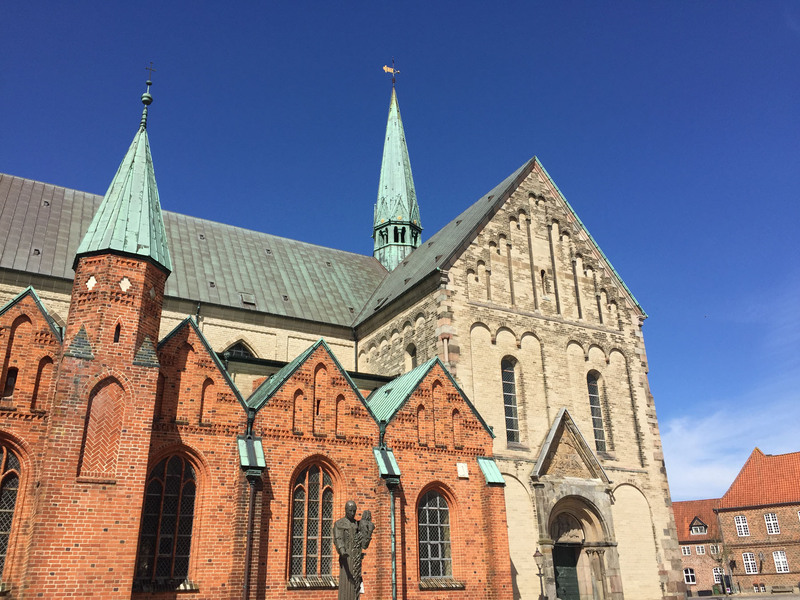 We later learned it was called Kannikegården, designed by Danish architects Lundgaard and Tranberg, and housed, amongst other things, the ruined footprint of a 9th century monastery that was discovered during renovation works. 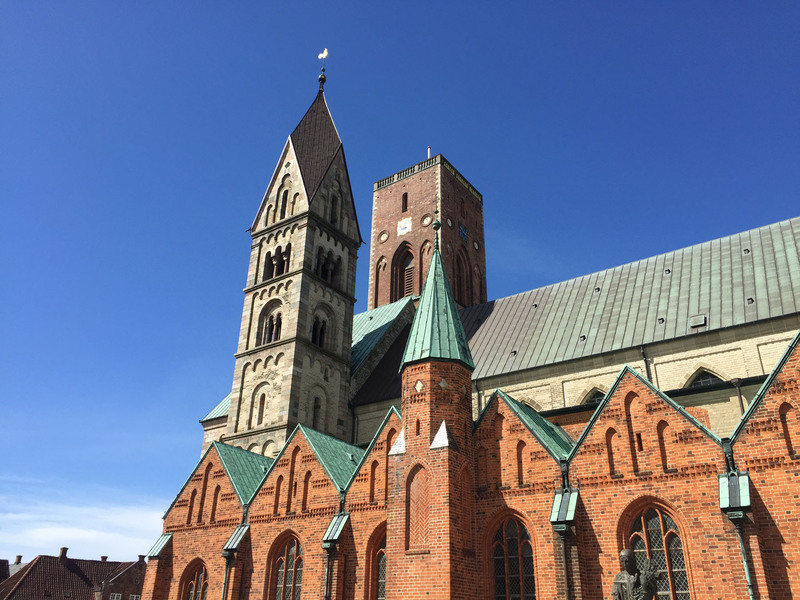 The construction of the cathedral began around 1150 CE, on the site of a previous church dating from around 860 CE. Many changes and extensions have been added over the following centuries, with a southern portico added in the early 1900s. 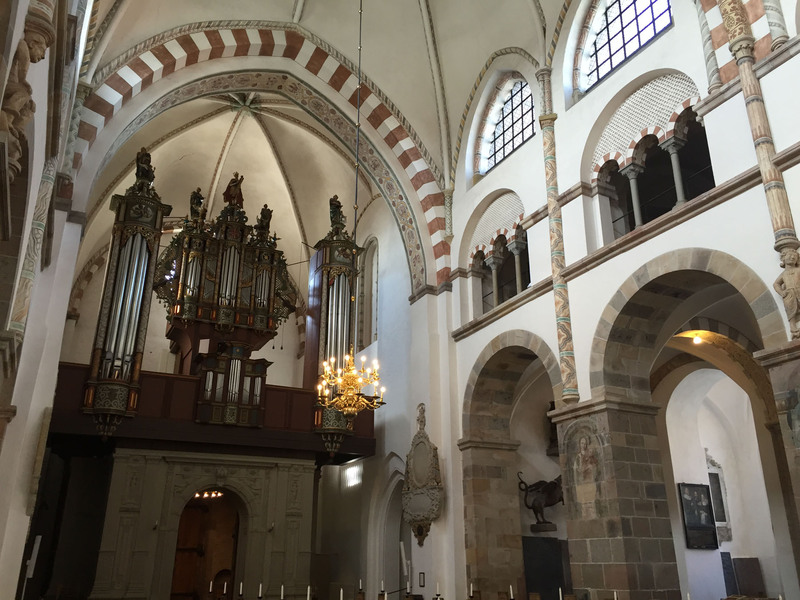 The interior was less decorative than the external, simply adorned with painted walls above and exposed stonework arches below, with the primary detail added from intricate carvings on the high-backed wooden pews. The eastern end had unusual stained glass windows that looked like they had been recreated faithfully from the winners of a primary school competition to draw a Biblical story, mistakes, unusual colours and all. Later that evening we had a long walk around the outskirts of the city, through parkland and along riverbanks, before returning to the centre where we joined a tour of the city given freely by a storyteller in the guise of the city’s Nightwatchman. 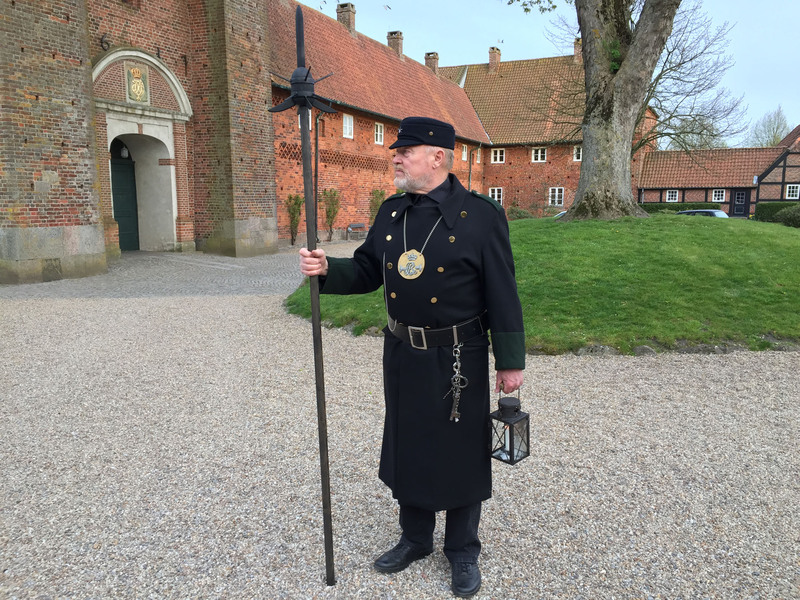 He took us around various parts of Ribe, singing loudly to inform citizens of approaching bedtime, telling stories in both Danish and English, and providing informative titbits about serious and irreverent parts of local history. We learned there was a large fire in 1580 where 231 houses in the centre were lost, after which a law was passed decreeing that thatch was no longer allowed to be used within the city limits. 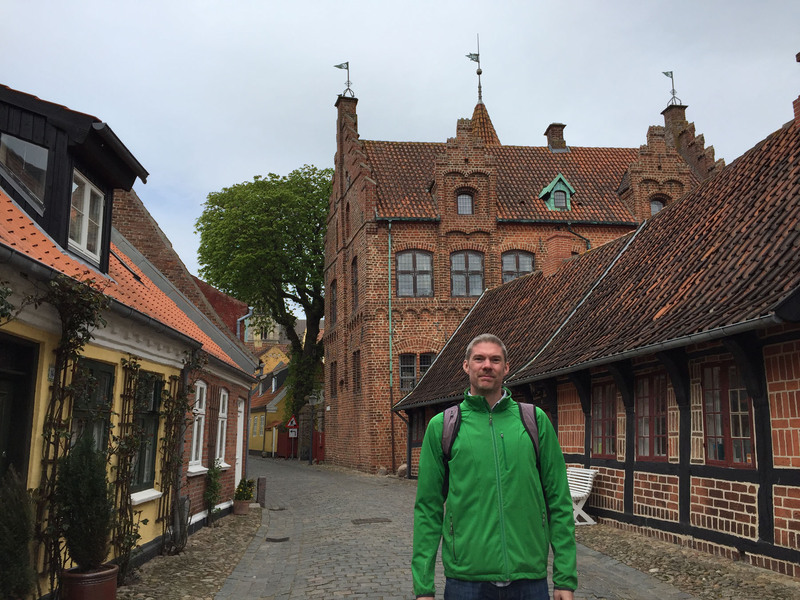 We heard wild stories of plagues and pirates, of rich merchants and poor monasteries, and of a war with Sweden that sounded like a Game of Thrones plotline. The following morning I went for a run around the same marked path we had walked, a route of around 8km, as a pre-breakfast wake up. It was delightful to have been in a town for less than 24 hours, and feel relaxed and already knowledgeable enough of its layout to enjoy a multi-terrain run. We ate breakfast on my return, retrieved our bikes from Benny’s garage and headed north and west, to follow the noted ‘panoramic cycle’ route. Once away from town, we passed only one vehicle in the next 12km leading to the coast. There was a whole lot of very little in the flat and empty countryside, including the notable absence of people. We were accompanied only by the ever-present wind, the cyclist’s nemesis. 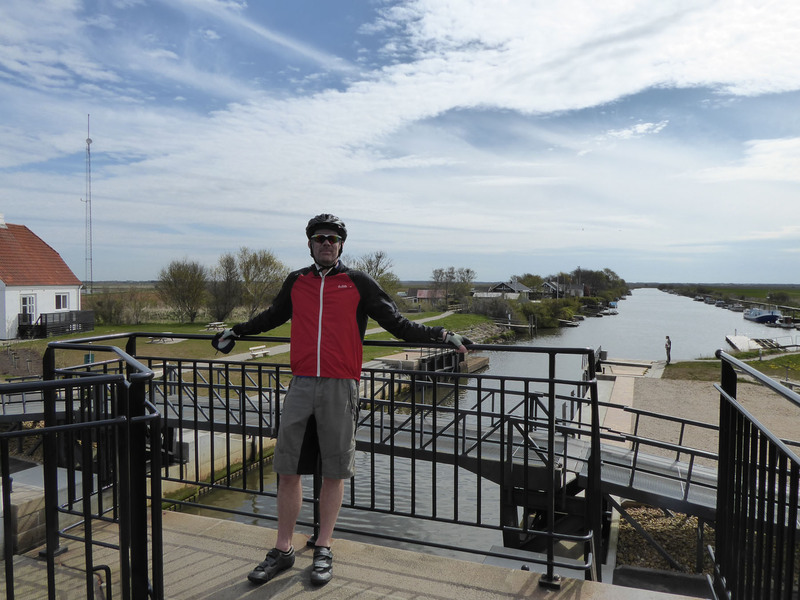 We reached tidal flood gates that looked much like a very large canal lock, and climbed their steps to look out to sea. We passed an island, Mandø, with a built causeway that was inaccessible at certain tidal times, similar to that connecting Holy Island. We considered crossing over, but knowing nothing of the tide times we decided not to risk being stranded for hours on the other side. 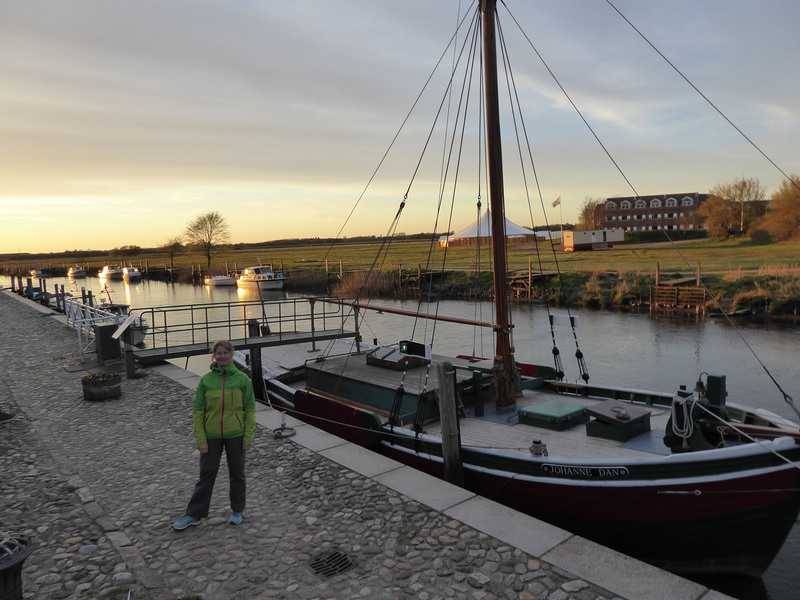 We turned a corner to return to Ribe and found we were facing a harsh, biting headwind, forward progress much more difficult. 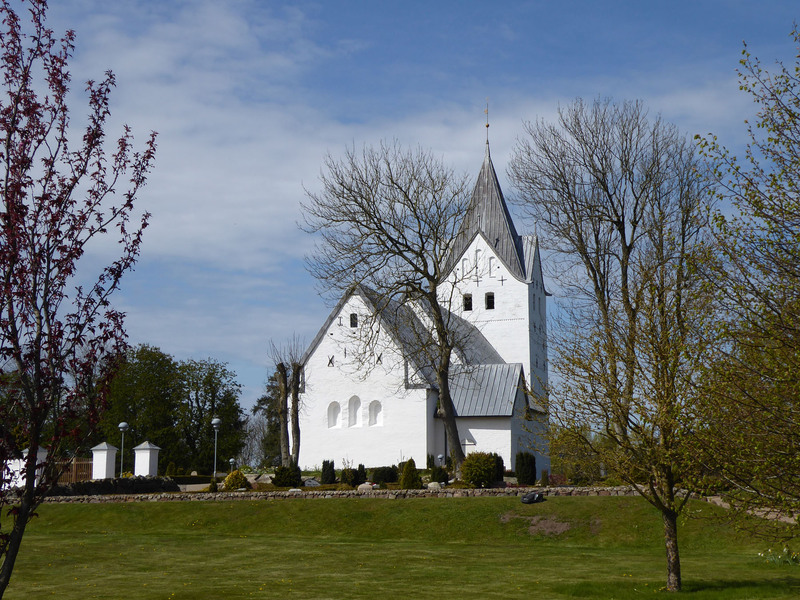 We slowly rolled through small villages, passing quintessential Danish scenes with white square-towered churches and manicured lawns. We found an off-road bridleway away from the road that was more sheltered from the wind and followed this back. The difficulty of riding the hard, deeply rutted track was fully compensated for by the wind break provided by dense trees lining the route. 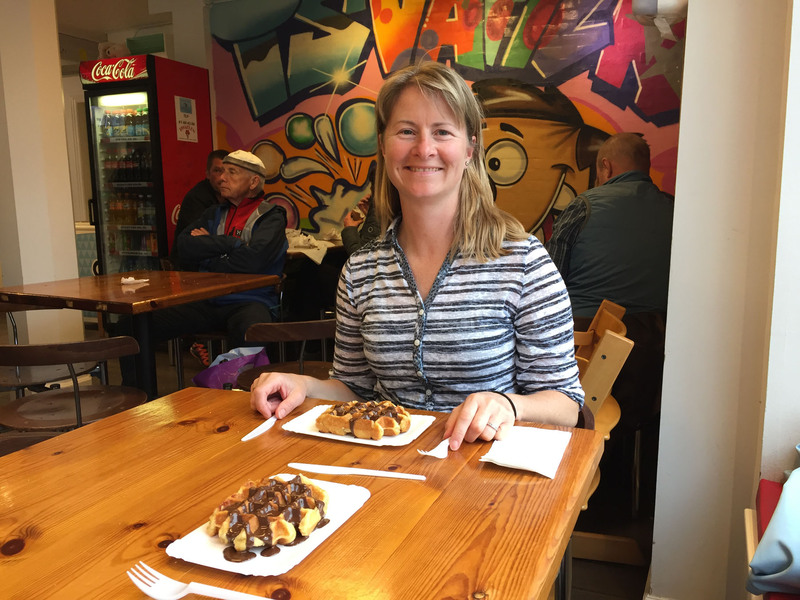 Later we wandered around town stretching our legs after the cycle, then rewarded ourselves with chocolate waffles, as the smell from the café had tantalised us from afar each time we had passed along the main street and could be ignored no longer. 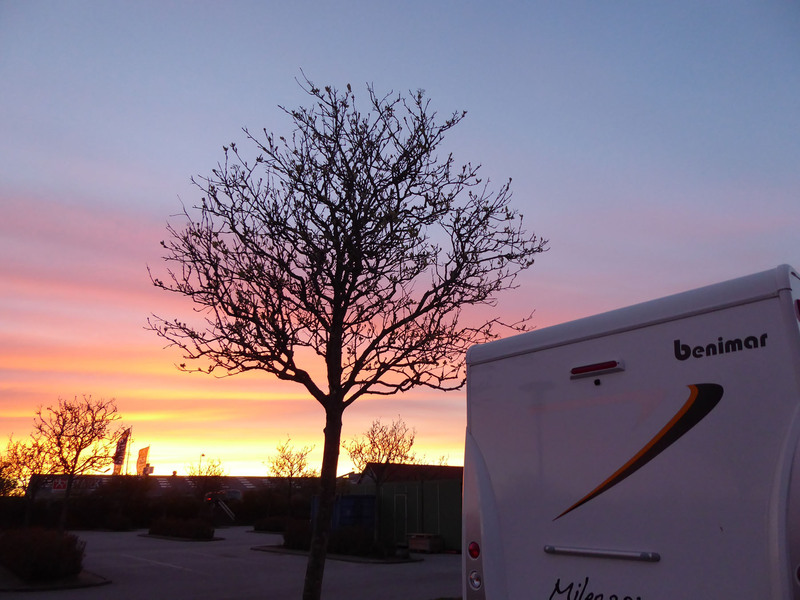 We briefly met up with fellow Benimar owners Gary and John, Facebook friends who were following a similar route to us through Netherlands, Germany and Denmark as they headed north to visit Norway and Sweden. 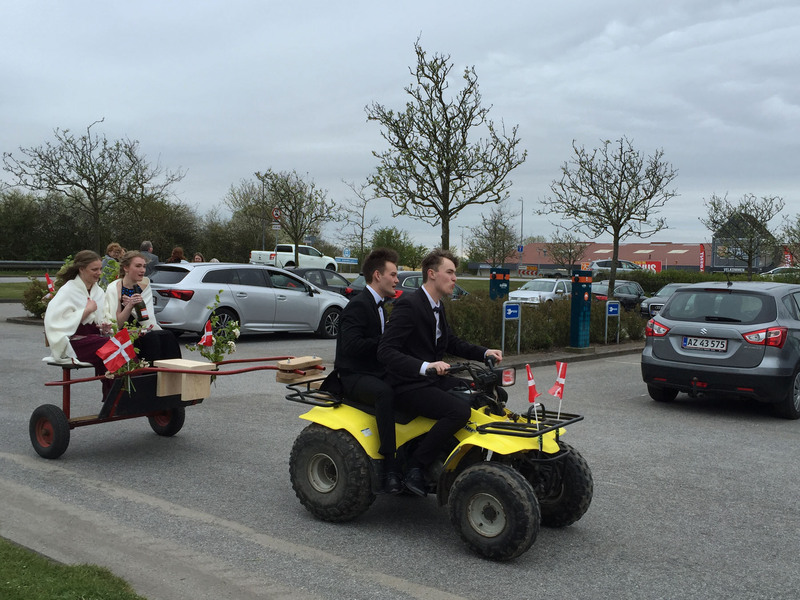 On return to Benny, we found the car-park had been overrun with well-dressed students readying themselves to attend their prom, all preparing different modes of towed transport in lieu of hired limos. The vehicles ranged from a speedboat decked out with garlands and ribbons, to a wooden cart fixed behind a bright yellow quad bike. There were colourful rickshaw bicycles, decorated tractor trailers and a hand-painted horse-drawn carriage. There were quirky, sweet, funny and posh transport options, each displaying different qualities and advantages, but all capable of delivering their young couples to the dance with smiles on their faces. It was fun to watch the festivities of what had the ring of revered annual tradition. 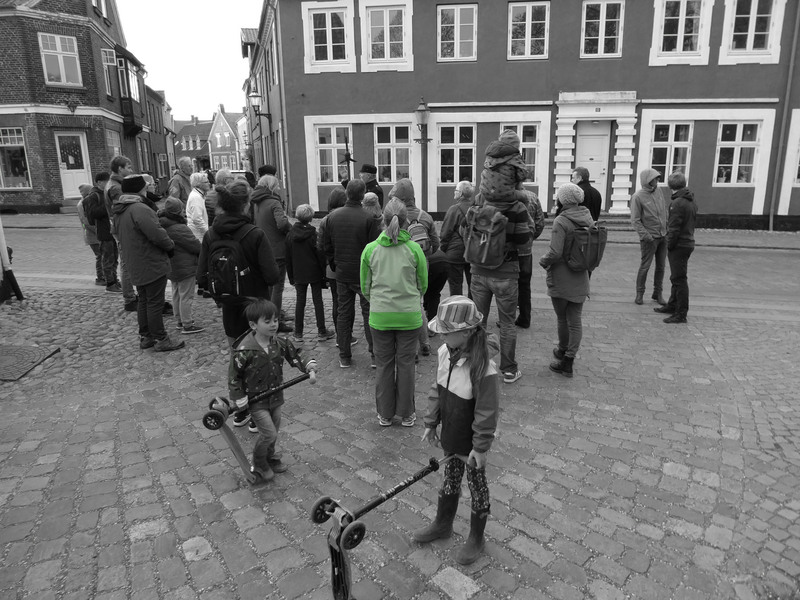 We had one last wander around the main square and nearby streets the following morning, reliving the sights this time under gun-metal grey skies. The town was still beautiful, quiet and welcoming; it had become comfortably familiar after a visit of only 42 hours. It was a shame to leave, but it was definitely time to visit a Danish beach. 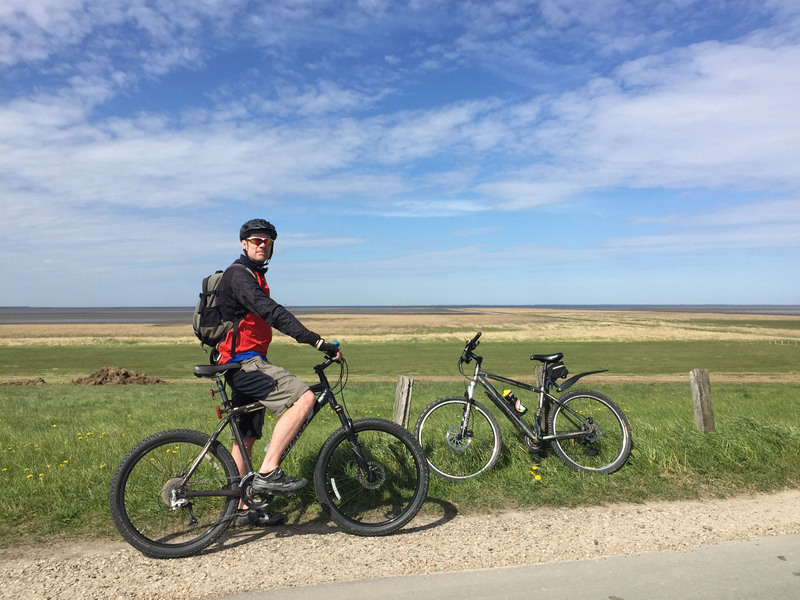 This entry was posted in 2017 Scandinavia Tour, Cycling, Denmark, In Denmark, Our Travel Journal on May 9, 2017 by Aaron Hill. Super as always but how did you manage to put Nicola in colour on an otherwise black and white photo?